If you are a wheelchair user or someone in your family is, you know the importance of having private or commercial transportation in order to get to and from the places you need to go. However, many people might not know how vital it is to have proper safety restraints for the wheelchair itself. The brakes on personal mobility devices alone are not enough to ensure the individual is safe while traveling in the vehicle therefore it is essential that an additional restraint or tie down system is installed in the accessible vehicle. There are three main types of wheelchair tie downs: manual, retractable, and power (also known as automatic). The manual and retractable systems use a four-point securement method, two in the front and two in the rear. They lock into either an L-Track or A-Track system which has been installed in the floor of the accessible vehicle. The power tie down system has one lock point located under the wheelchair. It is important to note that every type of restraint system still requires the wheelchair user to be positioned facing forward and to fasten a crash-tested seatbelt which has both the lap and shoulder belts. As the least expensive of all three restraint systems, the manual tie down does require the wheelchair user to have a companion or assistant to secure the wheelchair to the anchor points. The individual will have to place the tie downs on the wheelchair and adjust the excess tension of the straps with a ratchet mechanism or cam button/buckle. It is critical to the safety of the wheelchair user that the tie down is not attached to a moving part of the wheelchair. This will ensure that the wheelchair is properly secured. To release the tie downs, the assistant will either lift up on the ratchet-style mechanism or push the release button on the cam. Note that the tie down straps cannot be stowed and will remain on the floor of the wheelchair van. Because agility and strength are needed for proper fastening, the manual tie down system is not ideal for all wheelchair users. Prices for manual tie down systems start at just $99. The most universal, safest, and easiest restraint system is the retractable tie down. The wheelchair user simply connects the tie down to the wheelchair (again not to any moving parts) and the restraints self-adjust to tighten the straps in all four anchor points. The wheelchair user does need to have at least limited mobility of the arms for proper fastening or if a companion assists, he or she doesn’t have to be as trained or capable as the assistant using a manual tie down system. Ultimately, less effort and knowledge is required to use the retractable system. It is also more compatible than the manual restraint system and can accommodate any and all power or manual wheelchairs. To unlock the tie downs, the wheelchair user will put his or her finger or foot on the release lever. Retractable tie downs are compact in design and have less opportunity for tripping because the straps automatically retract back into the anchored device. This also keeps the belts out of snow, sand, salt, and soot which will extend the cleanliness and functionality of the system. Retractable tie down systems range from $350-$575. As stated above, the power tie down system only has one lock point. It does require a base to be installed into the accessible vehicle and a bracket to bottom of the wheelchair. This must be installed by a certified mobility dealer. Note that this application does not work for all wheelchairs and is installed according to the specifications of each wheelchair limiting its ability to be used by other wheelchairs. However, power tie downs are very effective if you are driving the vehicle. You simply drive into the channel of the locking device which will guide the wheelchair into place and secure the wheelchair for transportation. To release the wheelchair from the docking station, the wheelchair user has a release function on the dash or a manual release on the base. Pricing for this system ranges from $1,800-$2,400. Want to win a FREE tie down kit? Now is your chance! We have two tie down kits to give away so there will be TWO WINNERS! Enter for your chance to win either a Sure-lok AL800 Retractable Tie Down Kit OR a Q’Straint QRT-360 Retractable Tie Down Kit. Both require L-track anchor points and are ideal for your wheelchair accessible van to safely and securely lock your wheelchair into place. (If your vehicle has an A-Track anchor point or no anchor points, Q-Straint offers L-Track pods that can be bolted in any vehicle allowing for the tie downs to be compatible. These can be purchased inexpensively if you so choose.) Winners will be chosen at random and will be announced on the BLVD Facebook page and BLVD Blog. Values of the tie down kits range from $400-$600. Shipping of the kit is free for the winners. Please note only one entry per person. To enter, click here or fill out the form below. Good luck! 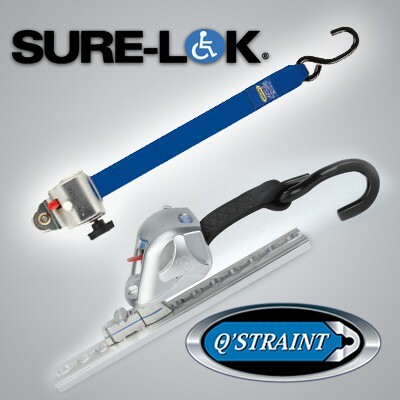 Special thanks to our friends at Sure-lok and Q’Straint for their partnership in this giveaway! 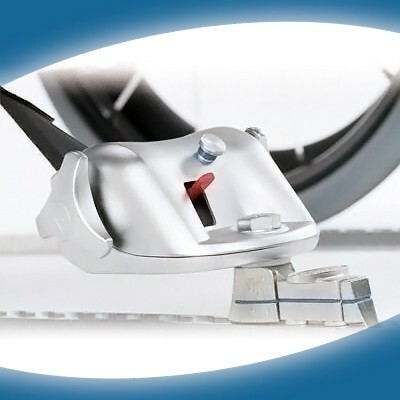 For more information on tie down systems, you can visit our “Wheelchair Tie Downs” page at BLVD.com. Here you can compare the various models available and learn about the different benefits of each. To locate a mobility dealer near you who can assist with further questions, installation, or service, click here.